Hi, I’m Steve Rowlands, Deputy Director for Digital Operations and I’m thrilled to be blogging about a major award success for HMRC Digital. 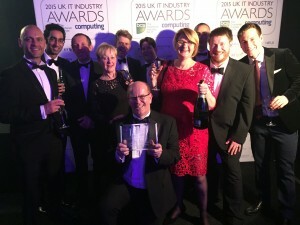 HMRC multi-channel digital tax platform has won Digital Project of the Year in the ‘Project Excellence’ category of the British Computer Society IT Awards 2015. This is awarded to the most outstanding web delivered project that achieved exceptional results while changing and improving business and public life. We’ve been designing and building our multi-channel digital tax platform over the last two years. It hosts all our digital services and utilises cloud infrastructure so we can scale things up quickly to meet peaks in demand. We’ve built it using open source tooling that saves licensing costs and we can put our code back into the public domain. The digital tax platform means we deliver new services in as little as six weeks, and have moved from two big disruptive IT releases a year to 50 releases a week with little or no disruption for customers. It’s enabled us to deliver 17 new digital services in the last year and 10 million HMRC customers now use services on the platform with 18 million visiting in the last year. We’ve been supported along the way by HMRC colleagues, external partners, a range of digital SME experts and Government Digital Service - it’s been a real team effort. Cutting edge projects on this scale are just one of many reasons why government is now a very exciting place for a tech career. I was honoured to accept the award on behalf of the whole team. It is one of my proudest moments in my 34 year career in the Civil Service. There were a range of strong candidates in our category and it is great that our work to improve customer service has been recognised. Finally, can I say a big thank you to everyone who has helped us over the last two years and here’s to the next two years. We never stand still so this isn’t the end of our tax platform journey. We’ve lots of work going on at the moment, including preparations for the 2016 Self Assessment peak in January. We’ll let you know how we’re getting on with further posts on this blog. A terrific achievement from an outstanding team. A proud HMRC achievement. Well done team. Congratulations to your whole team - a fantastic achievement!